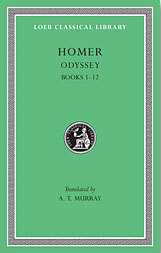 HOMER was a semi-legendary Greek poet from Ionia who the Greeks ascribed with the composition of their greatest epics--The Iliad and The Odyssey. The exact date of these works is disputed by modern scholars but they are usually placed in the C8th or C7th B.C. Homer. The Odyssey. Translated by Murray, A T. Loeb Classical Library Volumes. Cambridge, MA, Harvard University Press; London, William Heinemann Ltd. 1919. A recently revised version of this translation is available new from Amazon.com (click on image right for details). In addition to the translation the book contains the source Greek texts, Murray and Dimock's introduction and footnotes, and an index of proper names. Some more recent translations of the Odyssey and commentaries on the work appear in the booklist (left below). NOTE: I have quoted from the Shewring translation on the biography pages of Theoi.com rather than this older Loeb edition. Tell me, O Muse, of the man of many devices, who wandered full many ways after he had sacked the sacred citadel of Troy. Many were the men whose cities he saw and whose mind he learned, aye, and many the woes he suffered in his heart upon the sea, seeking to win his own life and the return of his comrades. Yet even so he saved not his comrades, though he desired it sore, for through their own blind folly they perished—fools, who devoured the kine of Helios Hyperion; but he took from them the day of their returning. Of these things, goddess, daughter of Zeus, beginning where thou wilt, tell thou even unto us. Now all the rest, as many as had escaped sheer destruction, were at home, safe from both war and sea, but Odysseus alone, filled with longing for his return and for his wife, did the queenly nymph Calypso, that bright goddess, keep back in her hollow caves, yearning that he should be her husband. But when, as the seasons revolved, the year came in which the gods had ordained that he should return home to Ithaca, not even there was he free from toils, even among his own folk. And all the gods pitied him save Poseidon; but he continued to rage unceasingly against godlike Odysseus until at length he reached his own land. Howbeit Poseidon had gone among the far-off Ethiopians—the Ethiopians who dwell sundered in twain, the farthermost of men, some where Hyperion sets and some where he rises, there to receive a hecatomb of bulls and rams, and there he was taking his joy, sitting at the feast; but the other gods were gathered together in the halls of Olympian Zeus. So saying, he led the way, and Pallas Athena followed. And when they were within the lofty house, he bore the spear and set it against a tall pillar in a polished spear-rack, where were set many spears besides, even those of Odysseus of the steadfast heart. Athena herself he led and seated on a chair, spreading a linen cloth beneath—a beautiful chair, richly-wrought, and below was a footstool for the feet. Beside it he placed for himself an inlaid seat, apart from the others, the wooers, lest the stranger, vexed by their din, should loathe the meal, seeing that he was in the company of overweening men; and also that he might ask him about his father that was gone. Then a handmaid brought water for the hands in a fair pitcher of gold, and poured it over a silver basin for them to wash, and beside them drew up a polished table. And the grave housewife brought and set before them bread, and therewith dainties in abundance, giving freely of her store. And a carver lifted up and placed before them platters of all manner of meats, and set by them golden goblets, while a herald ever walked to and fro pouring them wine. Then in came the proud wooers, and thereafter sat them down in rows on chairs and high seats. Heralds poured water over their hands, and maid-servants heaped by them bread in baskets, and youths filled the bowls brim full of drink; and they put forth their hands to the good cheer lying ready before them. Now after the wooers had put from them the desire of food and drink, their hearts turned to other things, to song and to dance; for these things are the crown of a feast. And a herald put the beautiful lyre in the hands of Phemius, who sang perforce among the wooers; and he struck the chords in prelude to his sweet lay. Then the goddess, flashing-eyed Athena, answered him: “Therefore of a truth will I frankly tell thee all. I declare that I am Mentes, the son of wise Anchialus, and I am lord over the oar-loving Taphians. And now have I put in here, as thou seest, with ship and crew, while sailing over the wine-dark sea to men of strange speech, on my way to Temese for copper; and I bear with me shining iron. My ship lies yonder beside the fields away from the city, in the harbor of Rheithron, under woody Neion. Friends of one another do we declare ourselves to be, even as our fathers were, friends from of old. Nay, if thou wilt, go and ask the old warrior Laertes, who, they say, comes no more to the city, but afar in the fields suffers woes attended by an aged woman as his handmaid, who sets before him food and drink, after weariness has laid hold of his limbs, as he creeps along the slope of his vineyard plot. Then, stirred to anger, Pallas Athena spoke to him: “Out on it! Thou hast of a truth sore need of Odysseus that is gone, that he might put forth his hands upon the shameless wooers. Would that he might come now and take his stand at the outer gate of the house, with helmet and shield and two spears, such a man as he was when I first saw him in our house drinking and making merry, on his way back from Ephyre, from the house of Ilus, son of Mermerus. For thither, too, went Odysseus in his swift ship in search of a deadly drug, that he might have wherewith to smear his bronze-tipped arrows; yet Ilus gave it not to him, for he stood in awe of the gods that are forever; but my father gave it, for he held him strangely dear. Would, I say, that in such strength Odysseus might come amongst the wooers; then should they all find swift destruction and bitterness in their wooing. Yet these things verily lie on the knees of the gods, whether he shall return and wreak vengeance in his halls, or whether he shall not; but for thyself, I bid thee take thought how thou mayest thrust forth the wooers from the hall. Come now, give ear, and hearken to my words. On the morrow call to an assembly the Achaean lords, and speak out thy word to all, and let the gods be thy witnesses. As for the wooers, bid them scatter, each to his own; and for thy mother, if her heart bids her marry, let her go back to the hall of her mighty father, and there they will prepare a wedding feast, and make ready the gifts full many—aye, all that should follow after a well-loved daughter. And to thyself will I give wise counsel, if thou wilt hearken. So spoke the goddess, flashing-eyed Athena, and departed, flying upward as a bird; and in his heart she put strength and courage, and made him think of his father even more than aforetime. And in his mind he marked her and marvelled, for he deemed that she was a god; and straightway he went among the wooers, a godlike man. She then, seized with wonder, went back to her chamber, for she laid to heart the wise saying of her son. Up to her upper chamber she went with her handmaids, and then bewailed Odysseus, her dear husband until flashing-eyed Athena cast sweet sleep upon her eyelids. Then wise Telemachus answered him: “Eurymachus, surely my father's home-coming is lost and gone. No longer do I put trust in tidings, whencesoever they may come, nor reck I of any prophecy which my mother haply may learn of a seer, when she has called him to the hall. But this stranger is a friend of my father's house from Taphos. He declares that he is Mentes, son of wise Anchialus, and he is lord over the oar-loving Taphians.” So spoke Telemachus, but in his heart he knew the immortal goddess. Now the wooers turned to the dance and to gladsome song, and made them merry, and waited till evening should come; and as they made merry dark evening came upon them. Then they went, each man to his house, to take their rest. But Telemachus, where his chamber was built in the beautiful court, high, in a place of wide outlook, thither went to his bed, pondering many things in mind; and with him, bearing blazing torches, went true-hearted Eurycleia, daughter of Ops, son of Peisenor. Her long ago Laertes had bought with his wealth, when she was in her first youth, and gave for her the price of twenty oxen; and he honored her even as he honored his faithful wife in his halls, but he never lay with her in love, for he shunned the wrath of his wife. She it was who bore for Telemachus the blazing torches; for she of all the handmaids loved him most, and had nursed him when he was a child. He opened the doors of the well-built chamber, sat down on the bed, and took off his soft tunic and laid it in the wise old woman's hands. And she folded and smoothed the tunic and hung it on a peg beside the corded bedstead, and then went forth from the chamber, drawing the door to by its silver handle, and driving the bolt home with the thong. So there, the night through, wrapped in a fleece of wool, he pondered in his mind upon the journey which Athena had shewn him.